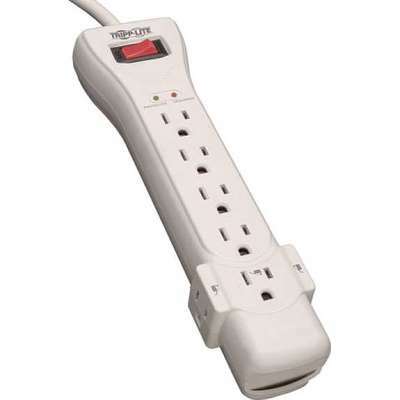 Surge protector with seven outlets is designed to protect electronic equipment against surges, spikes and line noise. Design accommodates bulky transformers without blocking remaining outlets. Surge protector offers EMI/RFI line noise filtering, protection up to 2160 joules, 7' cord with a right-angle plug, diagnostic LEDs and keyhole supports for wall mounting.